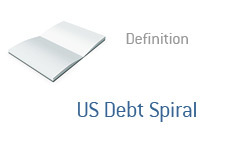 US Debt Spiral - What Does It Mean? What is the "US Debt Spiral"? What are the root causes of the "US Debt Spiral"? The US debt spiral is the phenomenon of the rapidly growing US national debt load, in addition to the country's underfunded liabilities. The rapidly expanding debt load of the United States leads to even more debt in the form of increased interest payments. The increased interest payments leads to bigger deficits, which in turn leads to an increased national debt load. Even accounting for a short-term improvement in the US economy, the White House still figures that the United States will be posting astronomical deficits for years to come. By the year 2020, the United States is expected to have a total national debt load of approximately $20 trillion dollars. The cost to service the public portion of that debt is expected to be nearly $800 billion per year, and that's assuming that we don't encounter significantly higher interest rates. The possibility of the United States paying off any significant portion of their national debt load in the future seems to be remote, at best, which will continue to inflate the country's national debt load. This is the US debt spiral, and it appears as though there is no stopping it.